Over the years, numerous medical studies have explored the idea that ibuprofen interferes with muscle growth, with conflicting conclusions. I know that there are some weightlifters who will take ibuprofen on a daily basis to combat numerous pain issues so that they can lift more comfortably, but this is something I would NEVER recommend. 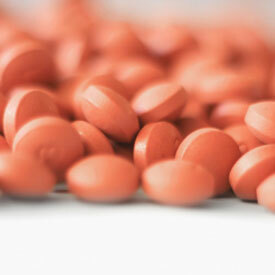 As a physician I am well aware of ibuprofen’s remarkable ability to shut down acute inflammation, but I am also aware of the risks of taking high dose ibuprofen over an extended period of time. I think it is also important to bear in mind that 1) there are different types of inflammation found in the body, and 2) some inflammation is actually necessary for optimal muscle growth. The reason why I broach this subject is that I also know people who lift who stubbornly refuse to take ibuprofen under ANY circumstances, stating that it isn’t worth the impaired muscle growth. These people could be in agony from a muscle strain, bursitis, arthritis flare-up, tennis elbow or any number of conditions which arise from localized inflammation, yet will refuse to take anything. I will see them at the gym, struggling to move the weight that they are accustomed to lifting, only to cut their lifting regimen short or sharply reduce the weight lifted. Some of these people are so intent on pushing through the pain that they often make things WORSE and have to stop training completely until their injuries subside. Now that is just stupid. It makes far more sense to tackle the acute inflammation systemically with ibuprofen and rest the area for a few days so that one can return to full capacity, rather than risk even greater injury which essentially forces one to stop training. I have recently dealt with a mild ankle sprain which I aggressively treated with ice, elevation, compression and high-dose ibuprofen for four days. Instead of being stubborn and refusing to take anything, I took 600-800 milligrams of ibuprofen twice a day with food, and also avoided any activities which required me to push off from my feet. I also refrained from doing any high impact moves which would aggravate my ankle. Was I concerned about adversely affecting my body’s ability to build muscle? Certainly not. Healing was my primary concern. Besides, there would have been no way that I could have trained the way I normally do while dealing with such outright pain, so it made sense to shut down the inflammatory process which was causing all the discomfort in the first place by taking the dreaded ibuprofen. I was smart about how I took it, and I did not take it for an extended period of time. Thankfully, it was a successful therapeutic treatment and I am glad I did it. With all this said, I am still very cautious about prescribing high dose ibuprofen. The effects on the gastrointestinal tract are significant, so it is imperative to eat when taking this medication. I also caution people against taking too many doses throughout the day. A very real example occurred with a friend who was apparently taking high doses of ibuprofen (600-800 mg 4 times per day) without food for severe daily headaches. This practice resulted in a peptic ulcer which bled enough to cause her to pass out twice, landing her in the emergency room. For those of you on the other side of the coin who have a habit of taking ibuprofen chronically, even if you are only taking 200 or 400 mg at a time, I highly recommend that you discontinue such chronic use. It is best to reserve ibuprofen for acute flare-ups. ← Proud To Be A MitoXcell Ambassador! What are the side effects in the gastrointestinal tract? This blog post was meant as an editorial piece. I wanted to keep it brief without getting into the side effect profile of ibuprofen.